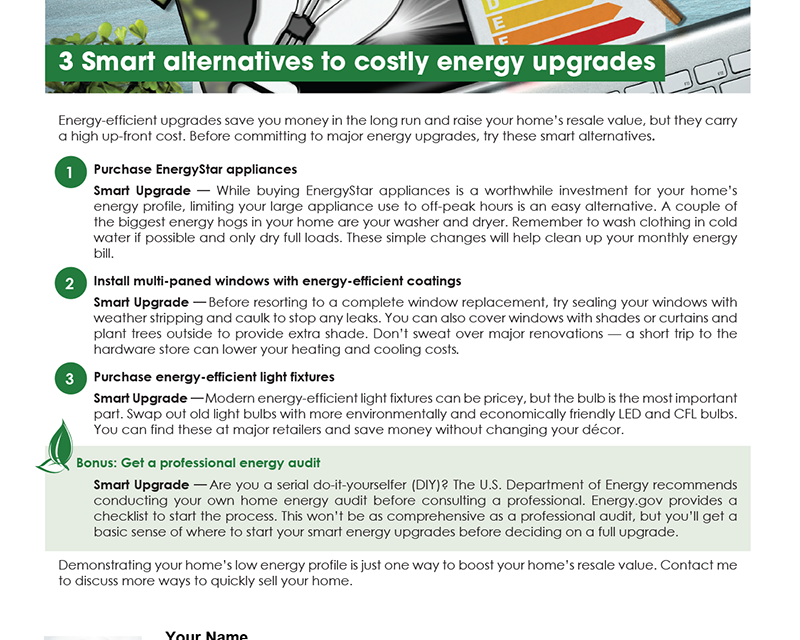 Energy-efficient upgrades save you money in the long run and raise your home’s resale value, but they carry a high up-front cost. Before committing to major energy upgrades, try these smart alternatives. 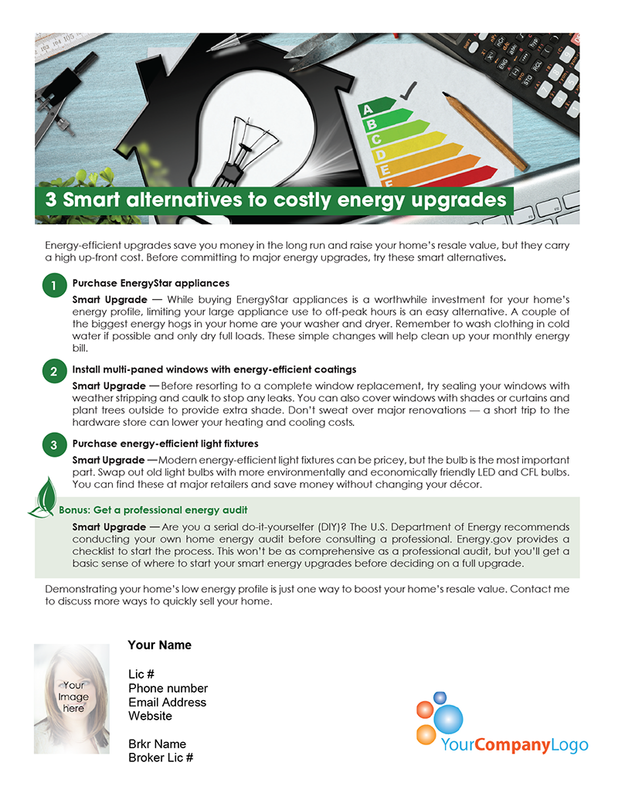 Smart Upgrade — While buying EnergyStar appliances is a worthwhile investment for your home’s energy profile, limiting your large appliance use to off-peak hours is an easy alternative. A couple of the biggest energy hogs in your home are your washer and dryer. Remember to wash clothing in cold water if possible and only dry full loads. These simple changes will help clean up your monthly energy bill. Smart Upgrade — Before resorting to a complete window replacement, try sealing your windows with weather stripping and caulk to stop any leaks. You can also cover windows with shades or curtains and plant trees outside to provide extra shade. Don’t sweat over major renovations — a short trip to the hardware store can lower your heating and cooling costs. Smart Upgrade — Modern energy-efficient light fixtures can be pricey, but the bulb is the most important part. Swap out old light bulbs with more environmentally and economically friendly LED and CFL bulbs. You can find these at major retailers and save money without changing your décor. Smart Upgrade — Are you a serial do-it-yourselfer (DIY)? The U.S. Department of Energy recommends conducting your own home energy audit before consulting a professional. Energy.gov provides a checklist to start the process. This won’t be as comprehensive as a professional audit, but you’ll get a basic sense of where to start your smart energy upgrades before deciding on a full upgrade. Demonstrating your home’s low energy profile is just one way to boost your home’s resale value. 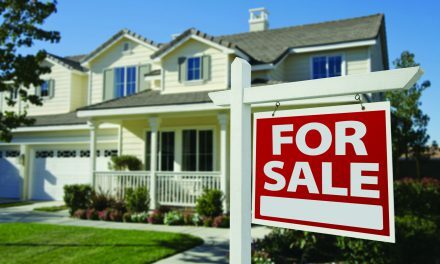 Contact me to discuss more ways to quickly sell your home.